Let's just say, for the sake of argument, that Daedelus can be considered the Obi-Wan Kenobi of the monome. If that's the case, then Trent Gill a.k.a. Galapagoose is clearly on some Luke Skywalker technique, representing the future of sample pad triggering mathematics. That may not sound like much when reading it, but hearing will make you a believer. The production skill displayed on Commitments suggests that Gill is gunning for sensei status, moving through rhythms with motions so fluid that the music controller may as well be an extension of his own body. The Spanish guitar work that opens “Don't Break The Spell" makes way for low-slung thumps and twisted vocal samples, flirting with subdued garage influences that hold shimmers of guitar feedback in the position of background wallpaper. “Planting The Seed” takes the baton and picks up the pace, running through digital textures and sung harmonies under wah-wah hallucinogens. Most of the album is immersed within a delicate interplay between the familiar and the alien as well as the structured against the carefree. “A Time For Us” features stumbling clicks and snaps falling over the hushed tones of a contemplative chorus while “Winkler” punches pads for guaranteed head nods. Syrupy synths provide the melody while synthetic wails resemble frequencies trying to escape the gravitational pull of a black hole. “One Who Can't Move” incorporates Frank Sinatra into a deconstructed house context, minimal in rhythm yet sumptuous in arrangement at the same time. In contrast, the aptly named “Hard Swallow” slowly builds in uneasiness, its heavily layered keys descending into dissonance and suspicion. Even while operating within more conventional song structures, the results are quite compelling. “Rhizome” leads with its vocalists toying with octaves and helium-fueled melancholy as the underlying melody builds in intensity and distortion. “Weight” is medicated jazz within a padded wall cell of white noise, disaffected crooning, filtered electronics, and faraway whistles. It's the musical equivalent of trying to make yourself feel numb to the chaos and disorder of life, but your emotions won't turn off to allow that to happen. Machines may bring this album together, but the humanity behind Commitments cannot be denied. 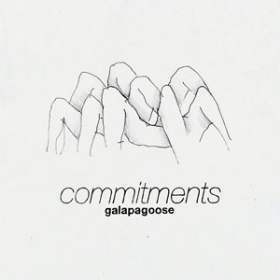 Beneath Galapagoose's dizzying production lies a wealth of feelings and thought that burst forth with every triggered pad. On “Attachments,” he can be heard singing the phrase “I'm weaving the sounds,” which perfectly captures his approach to making music. In the case of this album, the results are astounding, a patchwork quilt of folk, soul, and next level beat science that works its way into your bloodstream with each listen.